Taking orders for the classic, authentic, nostalgic, vintage, rare, orignal, limited edition, printed in Alabama SEARS shirts. You can’t get them in stores. Great for Christmas gift giving. So put your request in by an email to LaneKG Orders close Nov 1st 2008. Please pay John Hansel (Treasurer) if you like when you see him or pay when you pick up the shirts. Tripoli Central Alabama is hosting a research launch on Oct 25 at the Samson Site. The launch will begin at 10Am and go until dark. Tripoli research rules will be used. Tripoli insurance is also going to be used. All members who are 18 years old and a tripoli member are welcome to come fly commercial motors. If you are L2 certified, you may also fly homemade motors. We will have 3 pads and controlers. 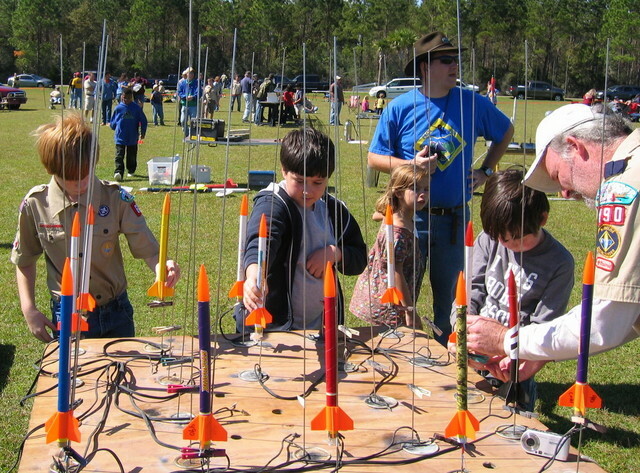 If you plan to fly estes rockets, you need to bring your own launch equipment. Spectators are allowed to attend, but cannot be in the rocket range for any reason. 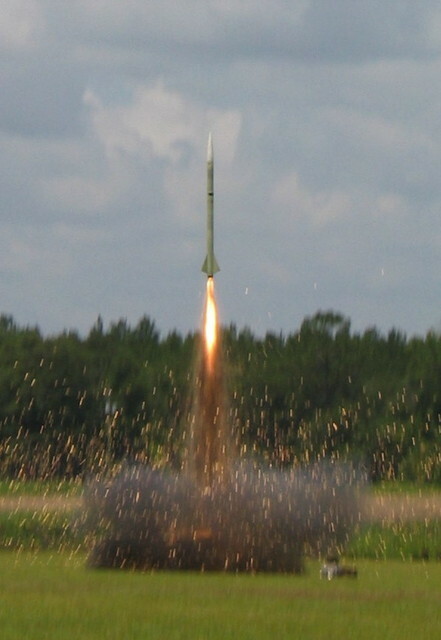 Chris’s Rocket Supplies will be on site, and has a 30%off retail sale running at this launch only. For more reserch information, check out www.tripoli.org or give Chris Short a call at 850-554-6531. We have L1, L2 and a L3 cert attempt going on. Hope to see people there. Note: The next monthly SEARS launch is Nov 1st. A witches broom flies solo and a tombstone on the pad. The weather was hot but not too humid with light winds the seemed to blow from just about every direction at some time or another. 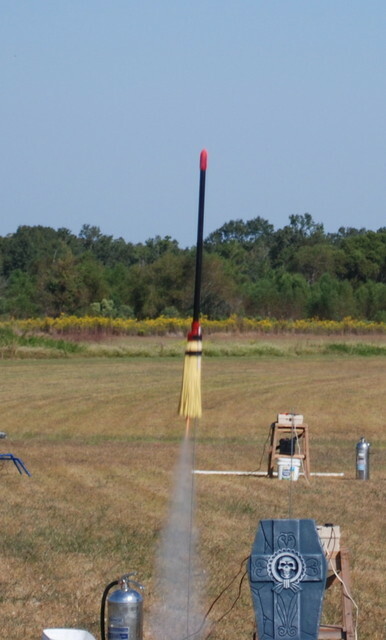 Alexa Stetson won the odd rocket contest with her Decaffinator. We had 13 paying members/families, there were new faces ( Dr. Roy and others) and some old faces (Bill Bosley, John Kegans). A safe and good time was had by all. 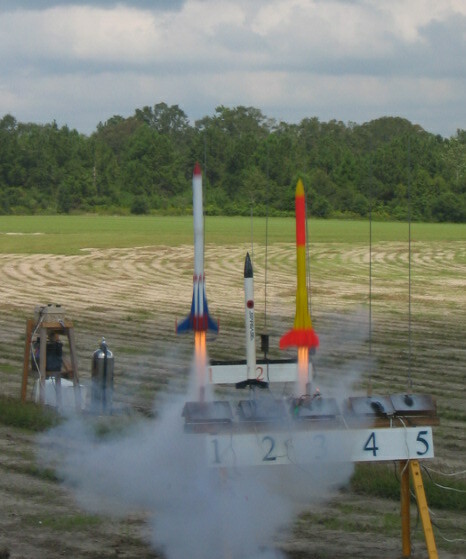 You are currently browsing the SouthEast Alabama Rocketry Society weblog archives for October, 2008.